Yeah, but the OW wants regs that will actually benefit those they protest. The Tea Party wants to restrain the government and that will actually hurt the big guys, by allowing the small ones room to grow. If you're big, you can pay someone $50k to track compliance, while the small guy that might impact their whole business model. Look at Europe and the turn over of the big names, as they restrain the government, the names turned over unlike before. I doubt the wall St. crowds believe in limited government, their beef against corporations is not because of crony capitalism that stem from "big government" . unlimited goverment outside the boundries of its constitutional constrains is not even something they identify as PROBLEM, for them crony capitalism is possible tactic if it leads to redistribution of wealth for institutions and desires they PREFER. 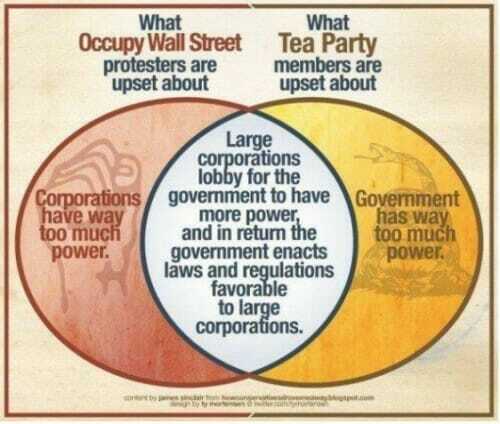 in fact "big goverment" is an intended result for them to achieve utopian social justice and equality so they dont really have anything in common with the tea party which is by itself is a response to BLUNT crony capitalism nursed by goverment breaching its constitutional limitations. The problem may not be an inability to make common cause, but rather the difference between a particular politicians positioning for the benefit of the low information voter vs their actual policy goals and/or influence pedaling behind the scenes. The main problem with Eliz Warren is that she does not truly see a problem with the Ex-im period. She still supports it despite her supposed dislike of cronyism. You said you don't have a reference for where you found the lead-in graphic. The original (unadorned) graphic of the Venn diagram can be found at http://howconservativesdrovemeaway.blogspot.com/2011/10/occupy-wall-street-vs-tea-party.html . The remade version (which you have a low-resolution version of) can be found at http://img32.imageshack.us/img32/4559/owsteag.jpg, and is by Ty Morgensen at https://twitter.com/tymorgensen (pointed to by his tweet at https://twitter.com/TyMortensen/status/126055647467941888 ). Oops, I didn't see this reply before I investigated and found specific URLs. Good sleuthing, I salute you!